Description: Prague and Egra. Bird's-eye views. Coloured. Description: Bohemia. After Ortelius. Inset coat of arms. 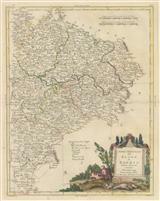 Description: Beautifully decorative map in later colour surrounded with panels depicting local figures and city plans. Description: Bohemia. Small map of region. Coloured. Description: Bohemia. Decorative cartouche. Original colour. Description: Plan of Prague with elaborate black and white cartouche. Along the lower margin runs a panorama of the city. Original hand colour. Description: Siege of Prague. The city and its defences. Description: Bohemia. Large cartouche. Original colour. Description: Bohemia, now part of the Czech Republic. A small military vignette is present on the upper right, a reference to the War of the Austrian Succession, in which Bohemia was a major theater. Original hand colour. Description: Bohemia and adjacent states. Cartouche. Coloured. Description: States of Bohemia. Cartouche. Original hand colour. Description: Eastern part of Bohemia. Cartouche. Original colour.